This post has nothing to do with diabetes. This post is about an 11 year old boy named Garrett Pope Jr. - Garrett was my cousin�s grandson and my second cousin�s son - which makes Garrett my cousin, twice removed. Last week Garrett lost his life to "The Choking Game," a deadly game where children and teens cut off their airwaves to get to the point where they reach euphoria. This game has been around for decades and I remember hearing about it when I was in middle school. Garrett's father posted what happened to his oldest son on The Concerned Citizens of Indian Land�s facebook page , and his heartfelt words (which I've cut and pasted below,) have gone viral via social media and news channels. I'm sharing what happened because I don't want it to happen to anyone else. Please read Garrett Sr's powerful words, learn from them, and have a discussion with your children so that this tragedy won�t happen to another family - and encourage everyone you know to do the same. Please share Garrett�s story with your friends and family, you will save lives and prevent much heartache in the process. Garrett, first Day of 6th Grade. �My name is Garrett Pope, and I�m the father of the 11 year old boy, Garrett Jr., who passed away tragically this past Wednesday. He was our oldest son, a 6th grade student at the middle school, had just started to play football on Tuesday night, wanted to go to Clemson, was funny, smart, and an amazing son to us and brother to his siblings. I know that there are a lot of rumors out there at to what happened, and my family would like to share some words of caution. 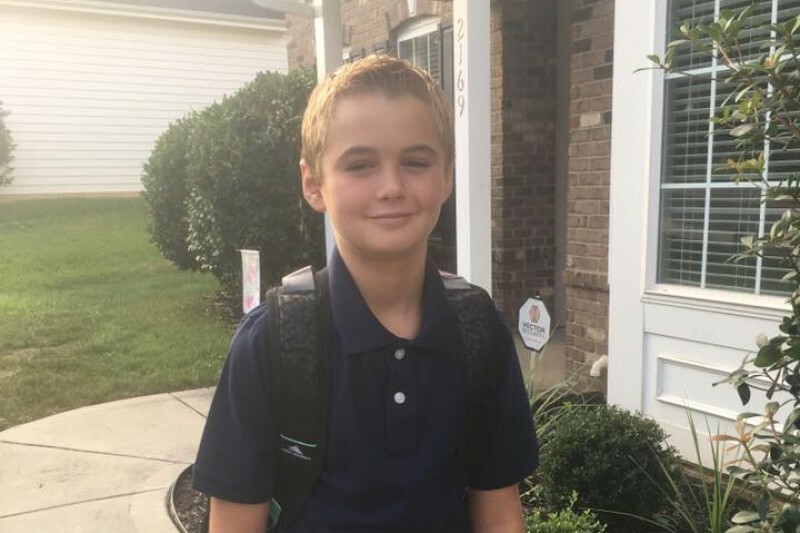 The Lancaster County Coroners office has determined that this was an accidental death caused by him playing something called �The Choking Game�. It is where kids cut off their airwaves just enough to get a sense of euphoria. I�m including a link here for more information. We do not know where Garrett learned this, but the logical source would be from other kids in school, or in our neighborhood. Our tablets and computers show no online research that he might have done. I�ve spoken to the principle about making sure that teachers are aware of this �game�. I work in the media industry, and local news outlets will be following up with more widespread coverage. Please know that his senseless death was not intentional. He took this terrible �game� too far. My family has never felt pain like this before, and we don�t anyone else to go through what we are going through. Please talk about this with your kids, and do everything you can to prevent a similar tragedy. He was so young and impressionable, he didn�t know what he was doing, and made a terrible mistake. To read more about Garrett, click HERE, HERE and HERE. AGoFundMe page has been set up in Garrett�s honor and all contributions will go towards something truly beautiful and lasting. Garrett loved to read and all donations to his GoFundMePage page will go to the Indian Land Elementary and Middle Schools to further develop their schools reading programs.